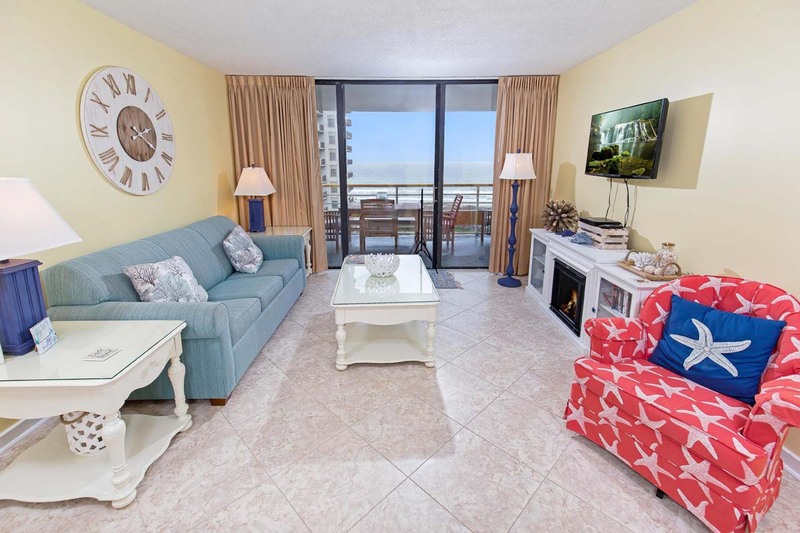 When you reserve a stay through Beach Vacations, you'll find there are numerous options for an amazing Myrtle Beach condo rental experience. 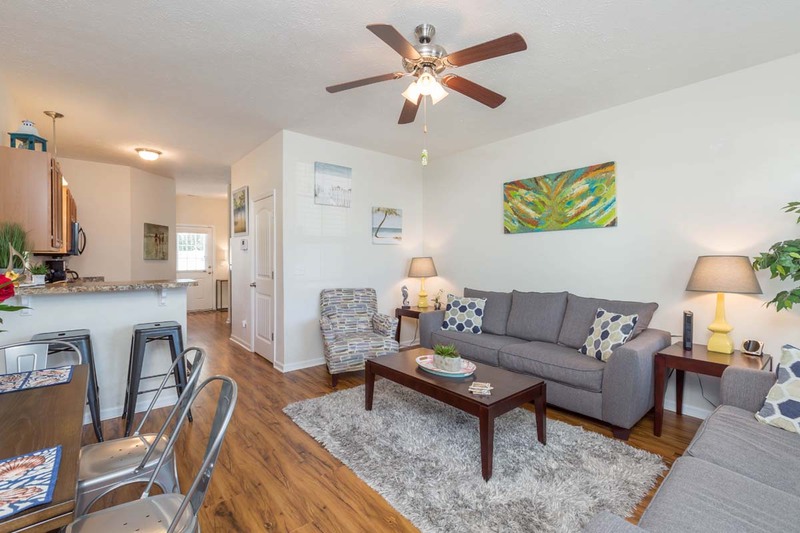 From Cherry Grove in North Myrtle Beach to the south end at Myrtle Beach Resort, you'll love the convenient and comfortable accommodations found in these units. Enjoy fully-equipped kitchens, sleeping and lounging areas, and private balconies whenever you book your next beach getaway in one of our seaside villas! Welcome to Boardwalk Beach Resort, where the comforts of home collide with the thrill of vacation! Come stay in unit 638, our 1 bedroom, 1 bathroom vacation rental, which comfortably accommodates up to 6 guests. With 2 Queen beds and a Queen-sized Murphy bed, there's plenty of room for your group! Enjoy the convenience of a fully-furnished kitchen, featuring major appliances and cooking essentials like cookware and flatware. 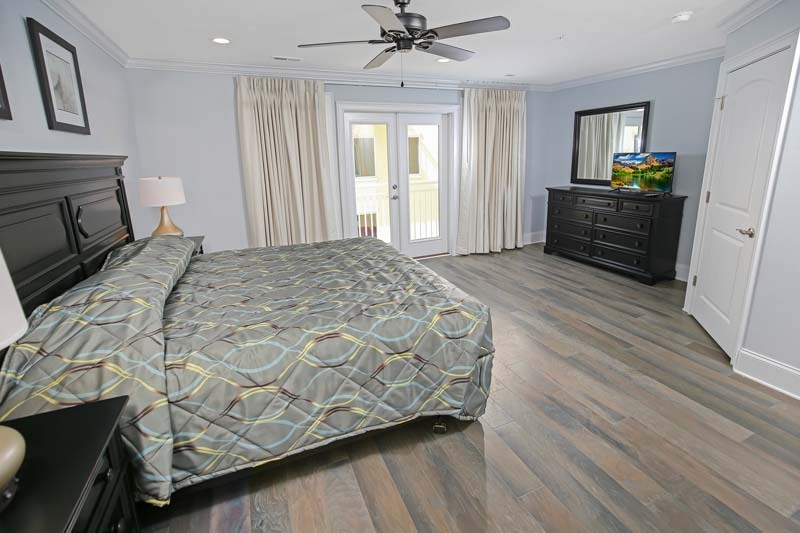 The unit includes tile flooring throughout, and offers up private balcony for relaxing mornings watching the sun rise over the Atlantic Ocean. Watch the news and all of your favorite shows on the multiple flat-screen TVs with cable found throughout the condo, and stay connected with complimentary WiFi Internet access. Take advantage of the resort's on-site amenities, which include 3 outdoor pools, 3 indoor pools, 3 kiddie pools, lazy river, and Jacuzzi! Welcome to Crescent Shores, where you'll find the comforts of home meet the excitement of vacation. 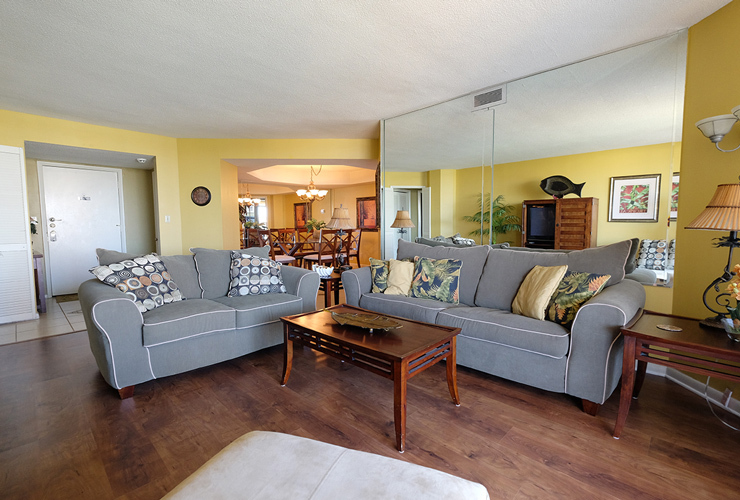 This oceanfront condo rental has 4 bedrooms and 3 bathrooms and accommodate up to 12 guests. With 2 King beds, 4 Queens, and a Queen-sized sleeper sofa, there's plenty of room for everyone. Take advantage of your 16th floor private balcony, where you can watch the sun rise each morning. Enjoy the fully-furnished kitchen, featuring major appliances and smaller ones like microwave and dishwasher. For your convenience, you'll find a washer and dryer in the unit, as well as multiple TVs. On-site amenities include Outdoor Pool, Outdoor Jacuzzi, Indoor Pool, Lazy River, Kiddie Pool, and Exercise Facility. Make the most of your Myrtle Beach vacation rental by booking a stay at Crescent Shores! 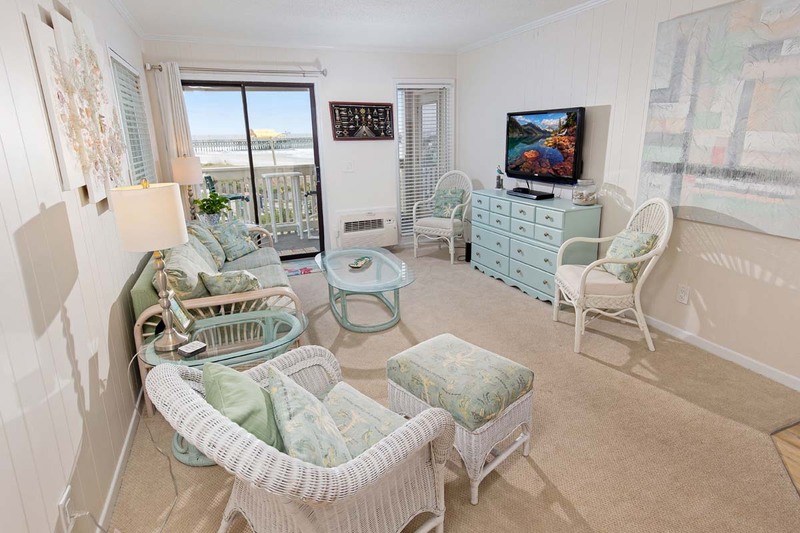 Vacation in style when you bring your next Myrtle Beach getaway to Dunes Pointe E18, our 3-bedroom, 3-bath condo located just a short walk from the beach! 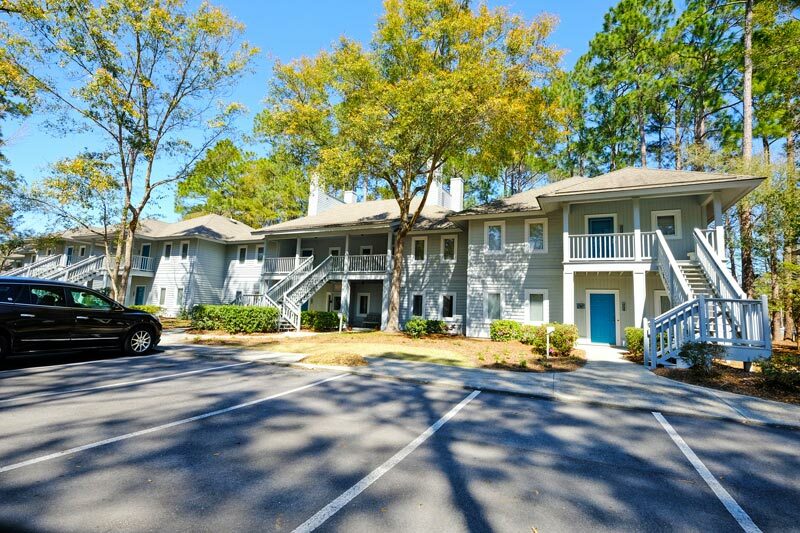 Situated on the North end of Myrtle Beach, this condo puts you within close distance to all of the area's most beloved attractions, including Tanger Outlets Mall, Broadway at the Beach, Pirates Voyage, and much more! 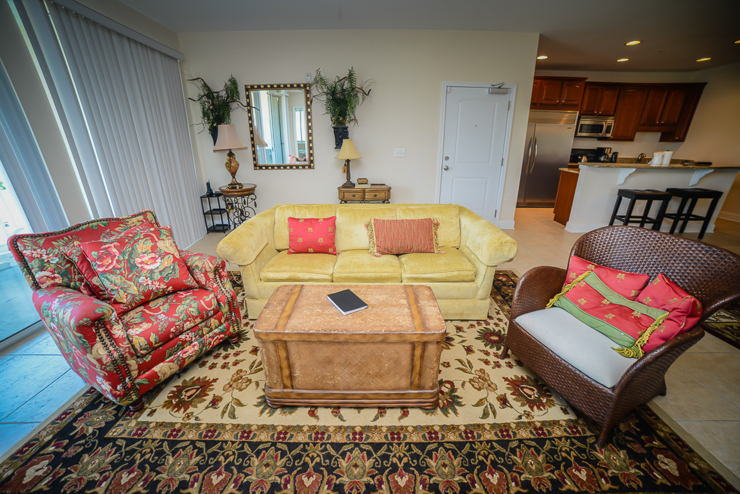 When you step inside Dunes Pointe E18, you'll find a cozy beach home-away-from-home. The unit features two full bedrooms, with a separate loft area with walk-in closet making up the third bedroom. The main bedroom includes 1 Queen bed, while the second features Twin bunk beds and an additional twin. The loft room includes two spacious Queen beds. 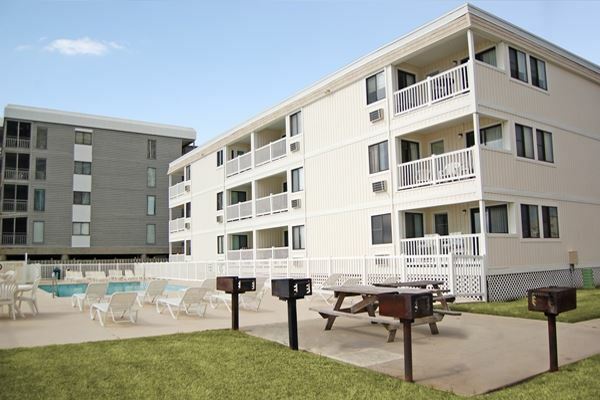 Enjoy the convenience of a fully-equipped kitchen, washer & dryer, and of course, easy beach access! 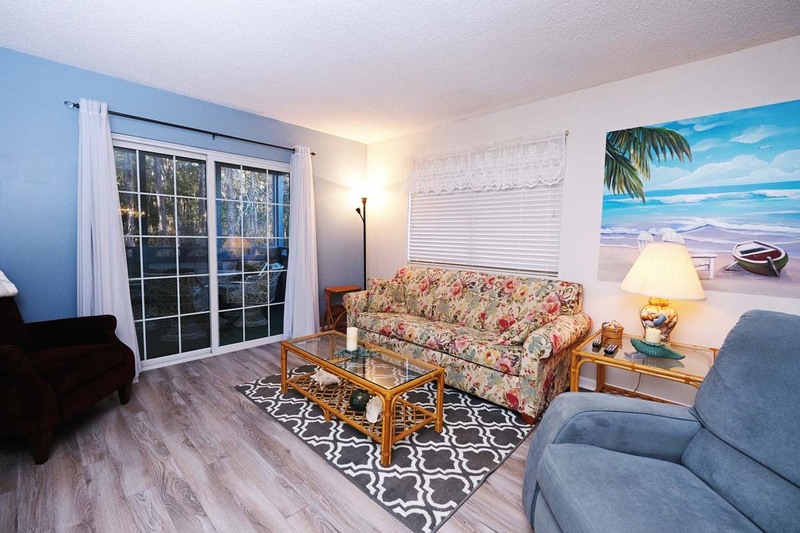 This condo features laminate flooring in the main living area, with plush carpet in the bedrooms. 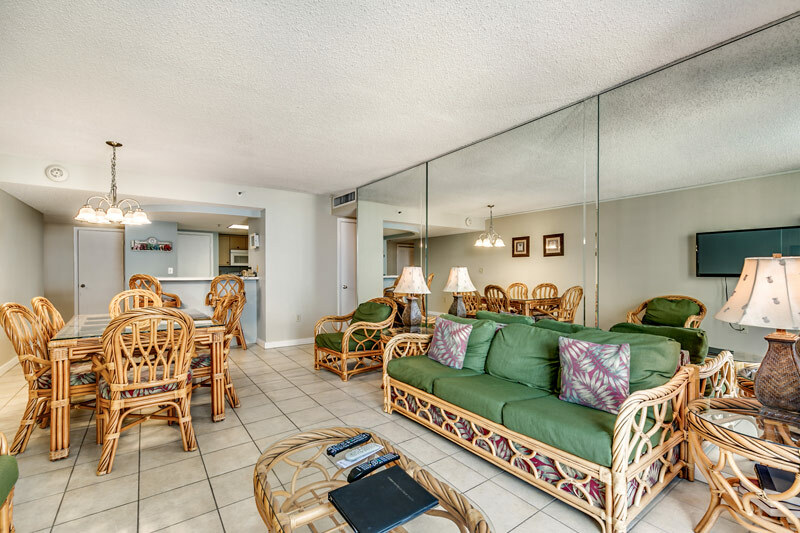 Guests can enjoy the sights and sounds of Myrtle Beach from the comfort of a large screened in porch and can take advantage of on-site amenities like indoor and outdoor pools, tennis courts, and Jacuzzi. Experience the best of Myrtle Beach when you reserve a stay in Dunes Pointe E18! 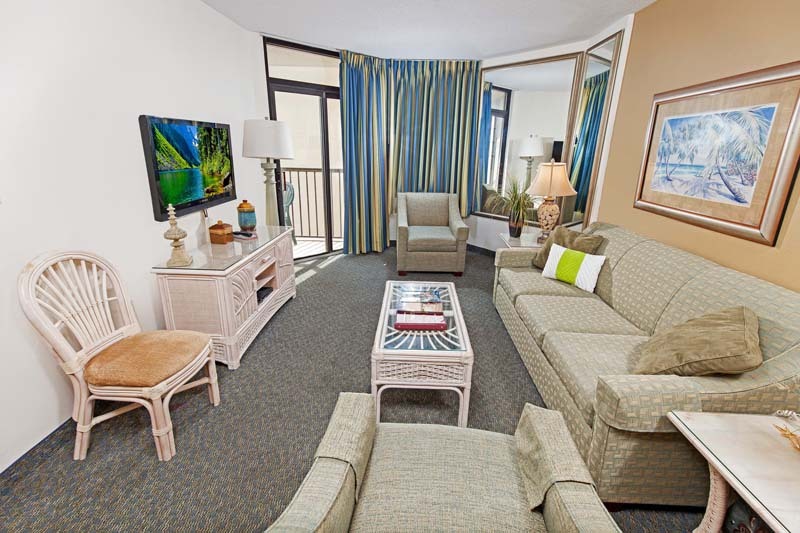 Welcome to Dunes Pointe F13, where the conveniences of home meet the adventure of vacation! 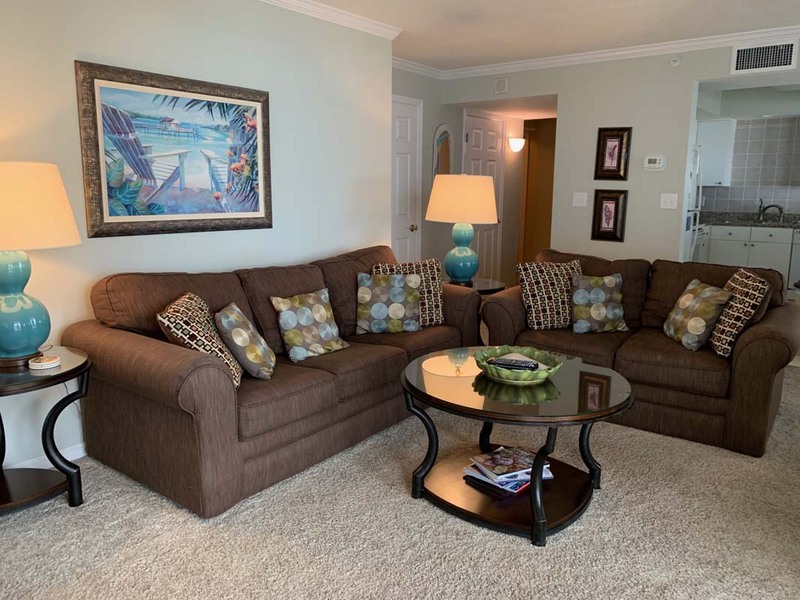 This 2 bedroom, 2 bathroom Myrtle Beach vacation rental can accommodate up to 6 guests and features 1 Queen bed, 2 Twins, and a Queen-sized sleeper sofa. Located on the 2nd floor, you'll be able to enjoy the sights and sounds of the beach from your own screen-in, private balcony. The ocean is just a short walk away, so take advantage of easy beach access! For your convenience, you'll find a fully-furnished kitchen, including major appliances and other cooking essentials, as well as a washer and dryer for all of your laundry needs. Enjoy watching cable from multiple TVs found throughout the unit. On-site amenities include an outdoor pool, Jacuzzi, BBQ grilling areas, and private beach access. 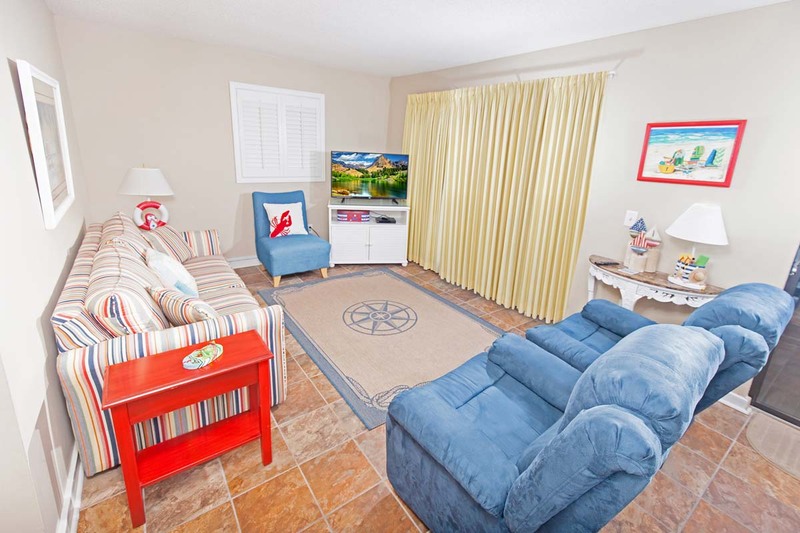 Gulfstream Cottages 324 is a cute 2-bedroom, 2-bath townhouse, located just a short walk from the beach, with comfortable accommodations for 6 people. Enjoy the comforts of home while vacationing, with wireless internet, central heating and air, and all of the appliances and accoutrements you'll need. 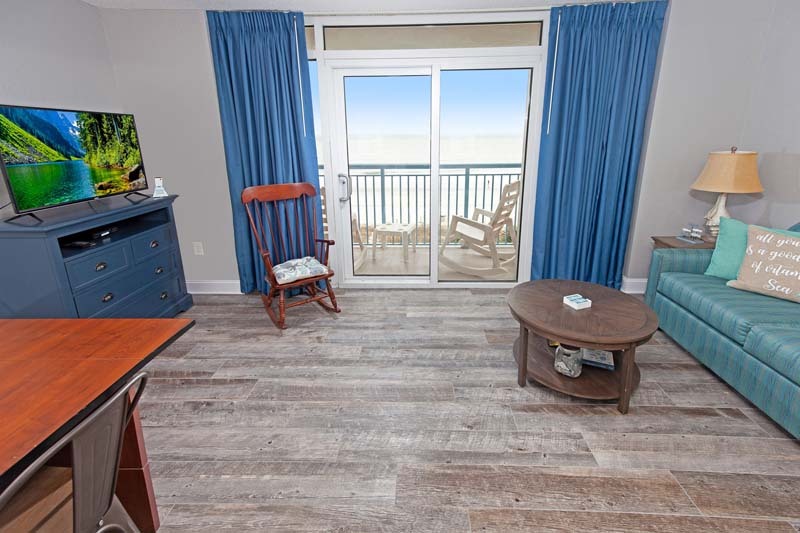 As you enter the covered front porch of Gulfstream Cottages 324 you will be greeted with warm wood flooring and cheerful furnishings in the living area, which offers seating for 5, a flat screen TV with cable and a Blu-ray DVD player that can stream Netflix. The couch is a queen-sized comfortable sleeper sofa. The first level also has a full bathroom with shower, and laundry with a washer and dryer. The kitchen, also on the first level, features black on black appliances, cool tile flooring, and additional seating for two at the counter. Everything you need to be able to prepare gourmet meals, from toasters, to blenders, to knives, is available to use while cooking in for family and friends. Retire to the second level for a luxuriously comfortable retreat in the two bedrooms, each with a queen-sized bed, comfy bedding, a television in each, and a shared bath with tub/shower combo with access from one bedroom. From the first floor, head out to the backyard patio to find a quiet refuge with a private bit of sunshine and a cool beverage to refresh with. Being the end unit allows for more green rolling spaces in the lush landscaped surroundings. Welcome to Gulfstream Cottages 344. This roomy 2 bedroom, 2 full bathroom townhome has enough space to comfortably sleep 7. 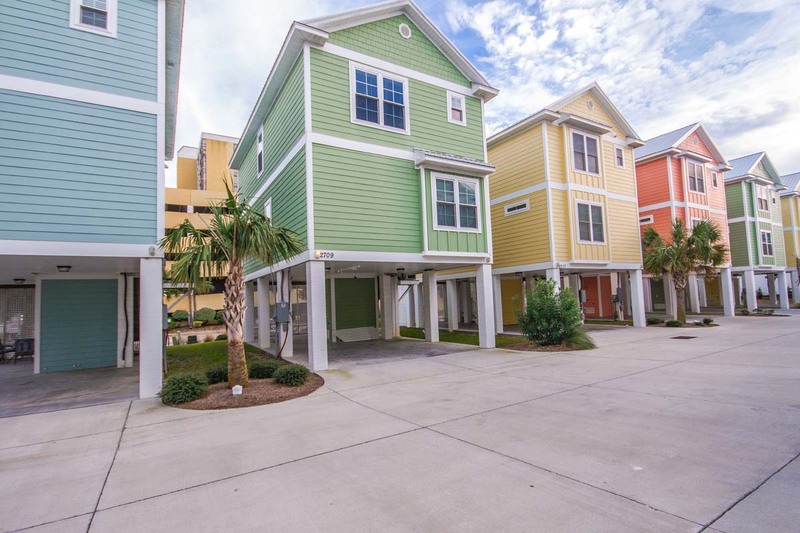 Situated on the quiet south side of Myrtle Beach, Gulfstream Cottages is just a short walk from the beautiful Atlantic Ocean and only minutes away from the most popular dining, shopping and attractions. Enter through the welcoming covered front porch into the living area, with warm wood flooring and neutral sea-toned furnishings. A queen-sized sleeper sofa offers seating for 6, and a large flat-screen TV with cable makes it fun to watch your favorite flicks and shows when you're not enjoying the beach and famous attractions. A full bathroom with shower and a washer and dryer are also located on the first floor. Sit down for a family meal at the dining table with seating for 4 and additional seating at the counter for 2. Smooth granite counters compliment the black-on-black appliances in the fully-stocked kitchen. You'll find everything you need to prepare gourmet meals for family and friends (when you're not enjoying the best restaurants in the Grand Strand). Bedrooms are located on the second floor of the townhome. One offers a queen-sized bed, comfortable bedding and new flat screen TV. The second bedroom also has a queen bed, as well as a daybed to allow for an additional guest to sleep. The bedrooms share a full bathroom with a tub/shower combo. The backyard patio is fenced in for privacy. Dine outside at the patio table, or enjoy the cool sea breezes with some cold beverages. 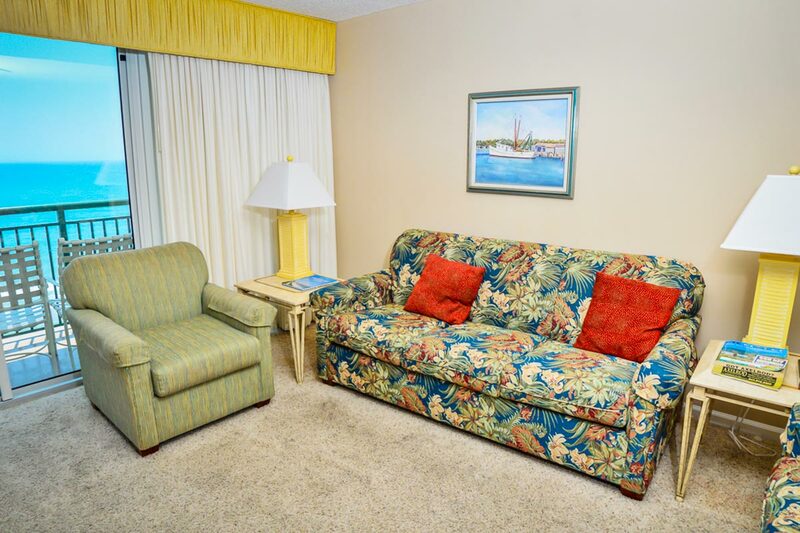 Make yourself at home when you stay in unit 931 at Holiday Sands at South Beach. 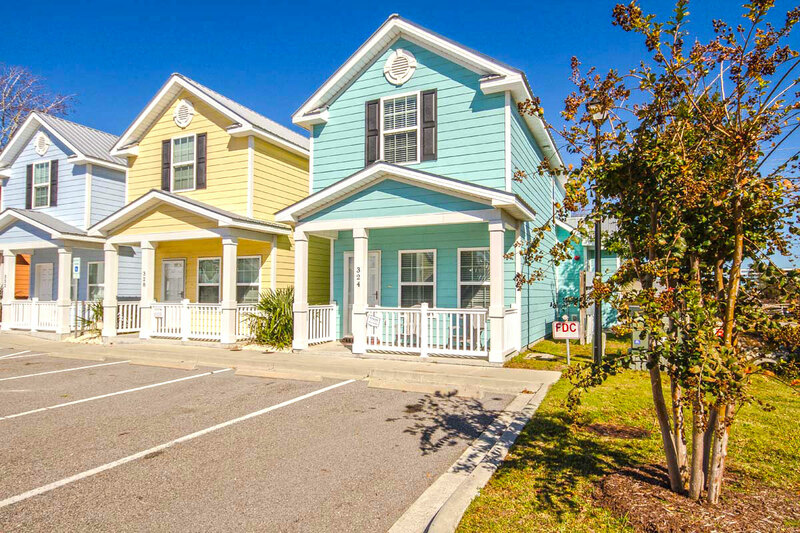 Located in central Myrtle Beach and conveniently near amazing attractions like Family Kingdom Amusement Park, Market Common, and Coastal Grand Mall, Holiday Sands is the perfect place for families and moderately-sized groups. This 2 bedroom, 2 bathroom ocean view condo can be found on the 9th floor, from which heights you will have a spectacular view of the beach and the Atlantic Ocean from your own private balcony. You won't want to miss the beautiful hues that accompany the horizon at dusk and dawn! This condo accommodates up to 6 guests and includes 1 King bed, 2 Queen beds, and a Queen-sized sleeper sofa. Take advantage of the fully-equipped kitchen, featuring major appliances, flatware, and cookware. For all of your laundry needs, a washer and dryer are available in the unit. The unit comes with complimentary WiFi Internet and access to multiple TVs throughout the condo. Spend your time at Holiday Sands 931 enjoying the on-site amenities, which include indoor and outdoor pools and hot tubs, lazy river, kiddie pool, fitness center, and restaurant. Make your next beach vacation a special one when you stay at Holiday Sands vacation rental 931 in Myrtle Beach! Choose Ibis 802 for your next Myrtle Beach vacation rental and experience the best of home conveniences, as well as the best of your beach vacation! This 2 bedroom, 2 bathroom condo is located just a short walk from the ocean, and it comfortably accommodates up to 5 guests. With 1 Queen bed and 3 Twins, this condo is perfect for smaller groups! 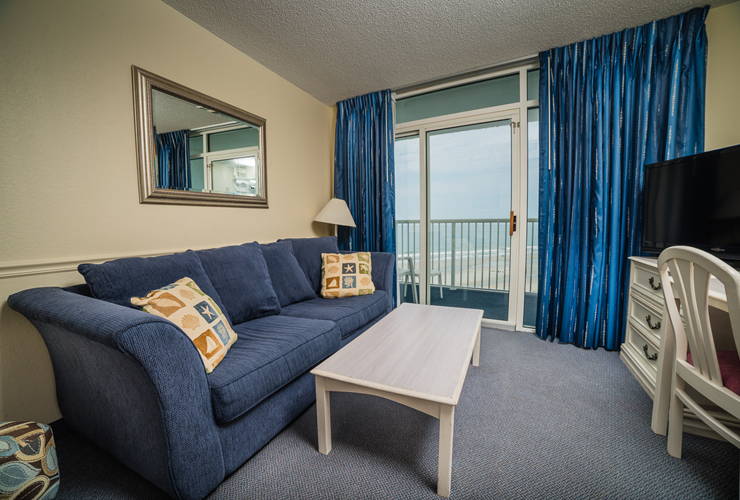 Located on the 2nd floor, enjoy your own private balcony, where you can take in all of the sights and sounds of Myrtle Beach. Enjoy the convenience of a fully-furnished kitchen, which includes major appliances and other cooking essentials, as well as in-unit washer and dryer. Stay connected with complimentary WiFi Internet access, and watch all of your favorite shows on any of the multiple TVs found throughout the condo. 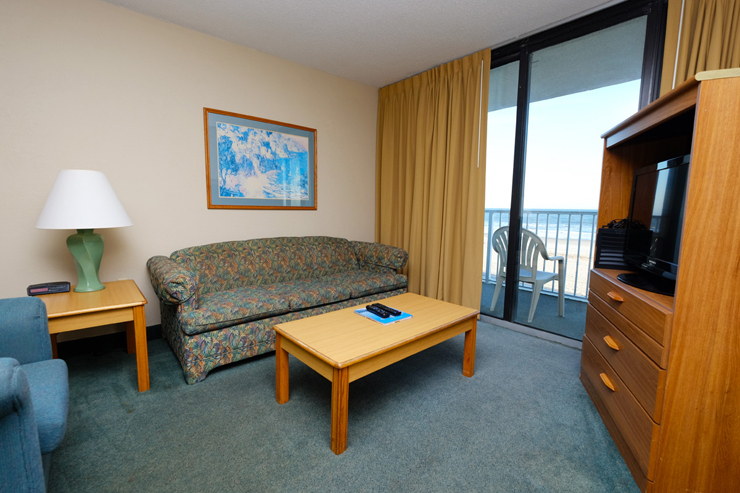 Make your next Myrtle Beach vacation rental Ibis 805, where comfort and convenience meet excitement and adventure to create a wonderful vacation experience. This 2 bedroom, 2 bathroom condo accommodates up to 6 guests and features 1 Queen bed, 2 Twins, and a Queen-sized sleeper sofa. Located on the 3rd floor, Ibis 805 is just a short walk from the beautiful Atlantic Ocean. Enjoy fully-furnished kitchen area with major appliances and cooking essentials like flatware and cookware, as well as in-unit washer and dryer. Enjoy watching your favorite shows on the multiple cable TVs in the unit, and stay connected with complimentary WiFi Internet access. 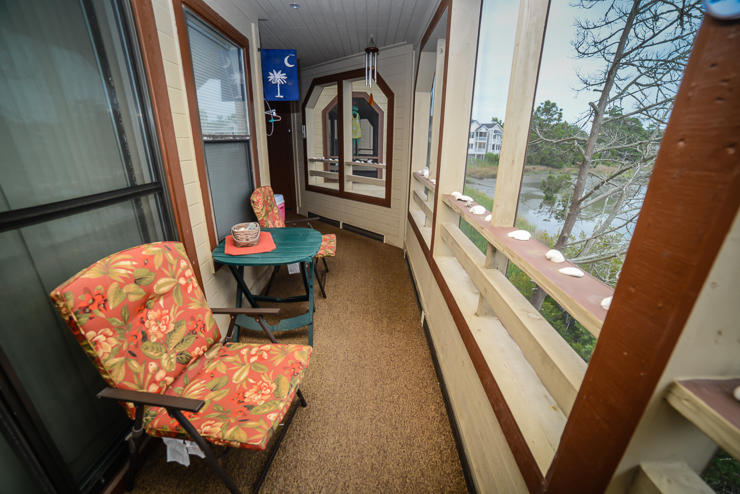 Spend some time outside on your private balcony, where you can take in the sights and sounds of Myrtle Beach! 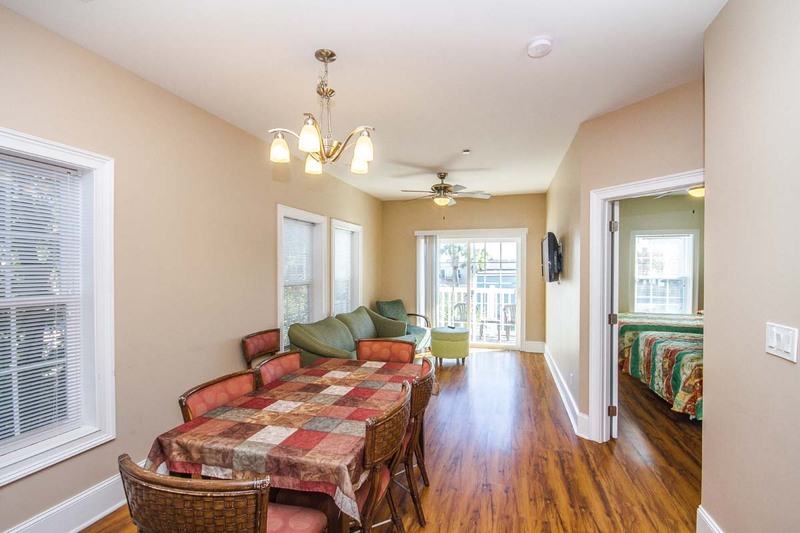 Come stay in your own "house by the sea" at Maisons Sur Mer in Myrtle Beach. Unit 110 is a 2 bedroom, 2 bathroom ocean view condo that can sleep up 6 guests. With 1 King bed, 2 Queens, and a Queen-sized sleeper sofa, there's room for everyone in your group! Located on the first floor, this vacation rental comes with a fully-furnished kitchen, featuring major appliances and cooking essentials, as well as in-unit washer and dryer for all of your laundry needs. Enjoy lovely views of the Atlantic Ocean from your private balcony, and stay connected during your stay with complimentary WiFi Internet access. 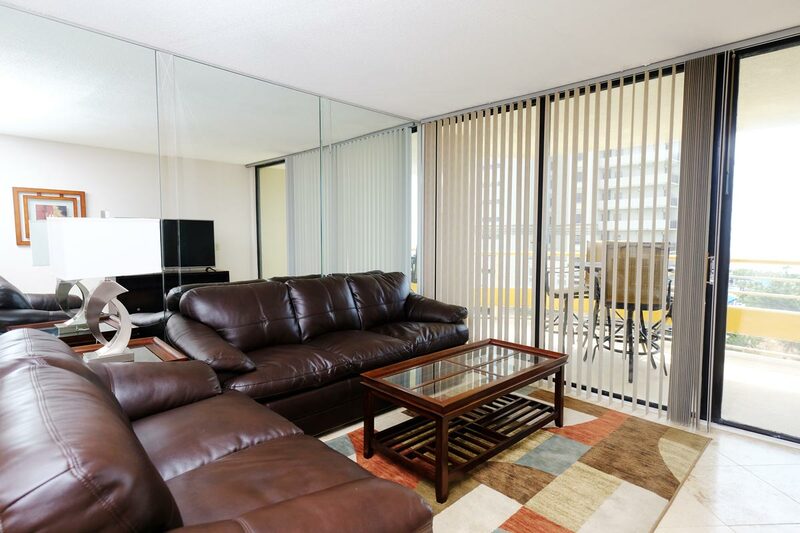 Enjoy watching television from the multiple flat-screen TVs found throughout the unit. On-site amenities include outdoor pool, Jacuzzi, tennis courts, exercise facility, and on-property restaurant! 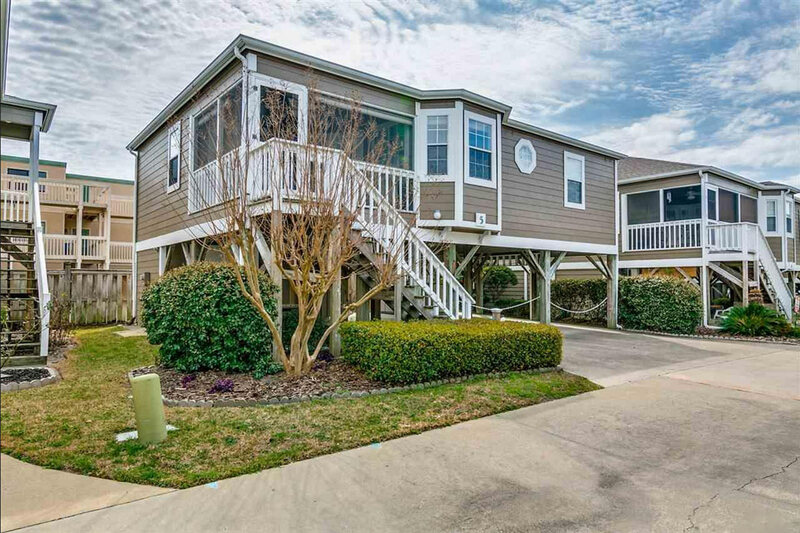 Maisons Sur Mer is French for House by the Sea, so settle in for your wonderful beach vacation at this resort located in Myrtle Beach. Unit 302 is a 2 bedroom, 2 bathroom ocean view condo, which comfortably accommodates up to 6 guests. 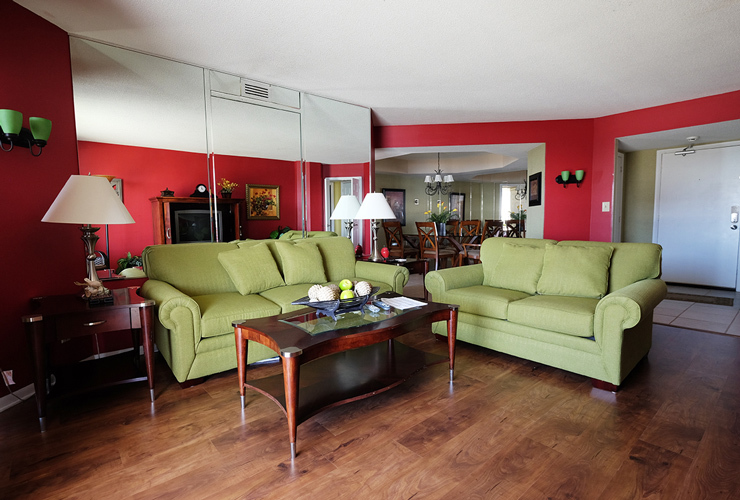 With 1 King and 2 Doubles, this condo is ideal for small to moderately-sized groups. Located on the 3rd floor, this condo features a fully-furnished kitchen, which includes major appliances and other cooking essentials. Take care of all of your laundry needs with the in-unit washer and dryer. Enjoy breathtaking views of the beach from your own private balcony. You'll be able to watch the news and all of your favorite shows on any of the multiple flat-screen TVs located throughout the condo. Take advantage of the on-site amenities, which include outdoor pool, Jacuzzi, tennis courts, exercise facility and restaurant! Located on the 18th floor of the North Hampton Tower, this beautiful 3 Bedroom condo features 1 King bed in the master and 1 Queen and 1 Twin bed in each of the two guest rooms. The kitchen is fully equipped with microwave and dishwasher and there is a washer and dryer in the condo. This condo also has Multiple Flat Screen TVs and DVD Player. Welcome to your next beach home-away-from-home, Ocean Blue 501! 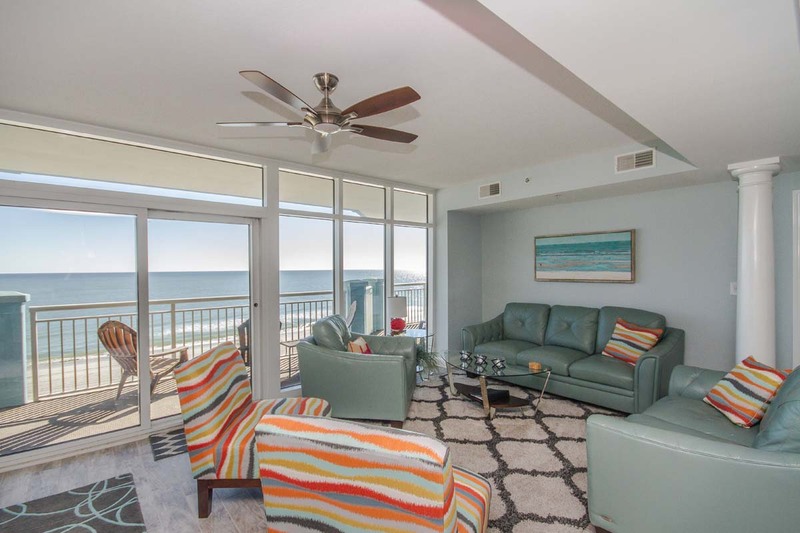 This 5-bedroom, 4-bathroom luxury condo is situated on the south end of Myrtle Beach, giving you both a laid-back and relaxing beach experience, as well as the nearby excitement of the city. With 5 spacious bedrooms, Ocean Blue 501 can comfortably accommodate up to 12 guests. Visitors will be impressed with the upscale and cozy furnishings found throughout the unit. Bedding includes a King bed in the master bedroom, two Queens in the second, one Queen bed in the third and fourth bedrooms, and a twin bunk bed set in the fifth room. Enjoy lounging and relaxing in the spacious living room or catch a movie on the 56" TV in the media room, where you'll find home-theater style seating and a DVD player. During your stay at Ocean Blue 501, take advantage of the fully-equipped kitchen, which features major appliances, cooking essentials, and decorative granite counters. Make use of two full-sized refrigerators, dual ovens, bar seating, and much more. Additional in-unit amenities include washer and dryer for all of your laundry needs, multiple large-screen TVs, including 60" television in the living room, complimentary WiFi Internet access, and a sprawling private balcony, overlooking the outdoor pool and ocean. Enjoy resort amenities including indoor and outdoor pools, lazy river, sun deck, hot tub, and workout facilities throughout the duration of your stay in Ocean Blue 501. When you're ready to explore the larger Myrtle Beach area, it will only be a quick drive to some of the area's top attractions, including the Market Common shopping and dining district, the Myrtle Beach Boardwalk and SkyWheel, Broadway at the Beach, dozens of golf courses, and so much more. Start planning your next Myrtle Beach getaway and enjoy a luxurious beach vacation when you book a stay at Ocean Blue 501. 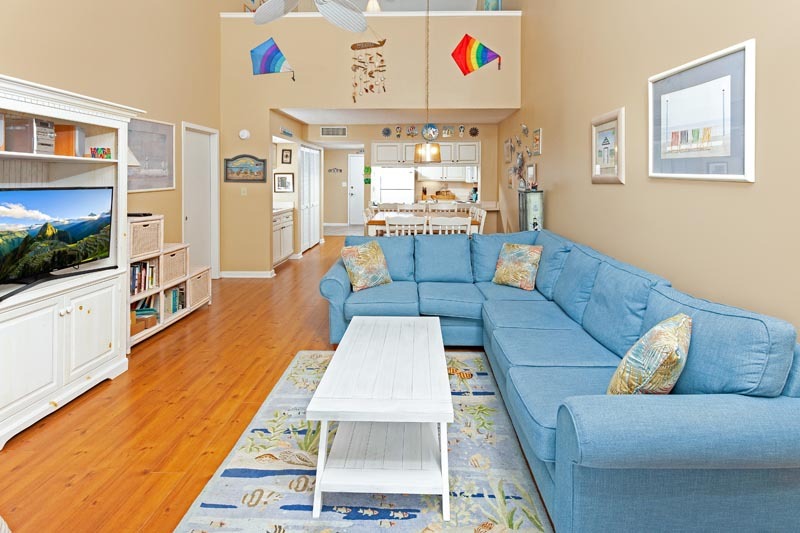 This 3 bedroom, 3.5 bathroom at Ocean Breeze is the perfect vacation rental for large groups. Accommodating up to 10 visitors, Unit 1A features 1 King bed, 2 Queens, 2 Twins, and a Queen-sized sleeper sofa. 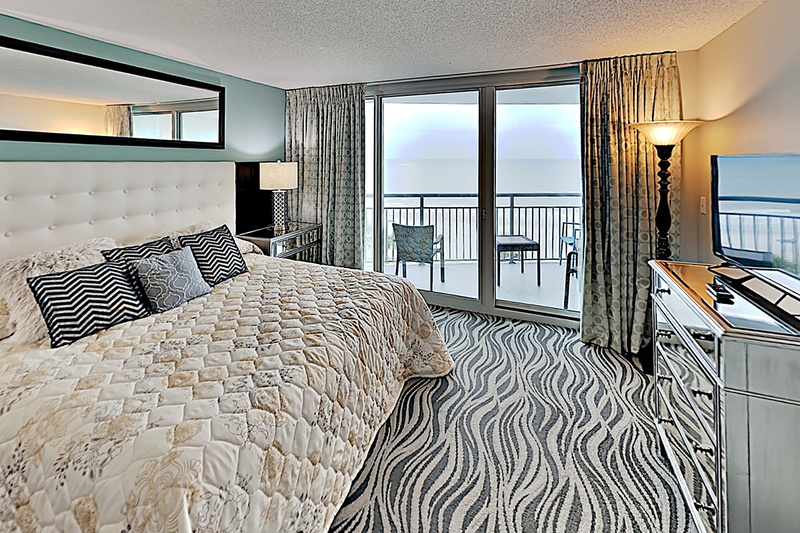 You'll enjoy the private balcony, where you can take in all of the sights and sounds of fabulous Myrtle Beach. Inside, enjoy the convenience of a fully-equipped kitchen, including major appliances and cooking essentials, as well as in-unit washer and dryer for your laundry needs. 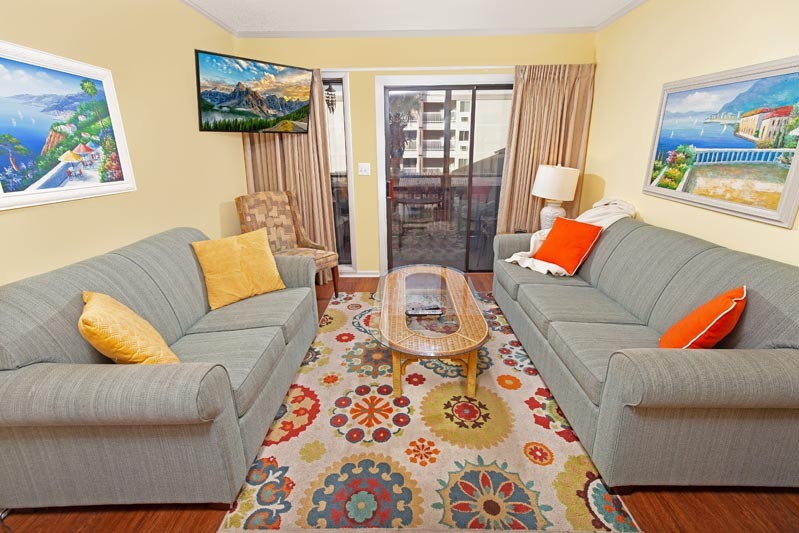 Watch the news and all of your favorite shows on the multiple flat-screen TVs found throughout the unit, and connect to the Internet with complimentary WiFi access. On-site amenities include sparkling and refreshing outdoor pool, perfect for those hot South Carolina days! You'll be able to easily walk to the beach during your beach vacation at Ocean Creek Lodge Villa 2341. This 2 bedroom, 2 bathroom unit features enough space to comfortably accommodate up to 6 guests. Bedding includes 1 Queen bed, 2 Twins, and a Queen-sized sleeper sofa. Located on the 4th floor, enjoy views of the area while relaxing on your own private balcony. Enjoy home-cooked meals using the condo's fully-furnished kitchen, which includes major appliances, microwave, dishwasher, and other cooking essentials. Stay connected with all of your favorite shows and news via the multiple TVs throughout the unit, as well as complimentary WiFi Internet access. Washer and dryer facilities are located on-property for your convenience. Other on-site amenities include outdoor pool, Jacuzzi, and tennis courts. Make your next North Myrtle Beach vacation rental a special one with a stay at Ocean Creek Lodge! 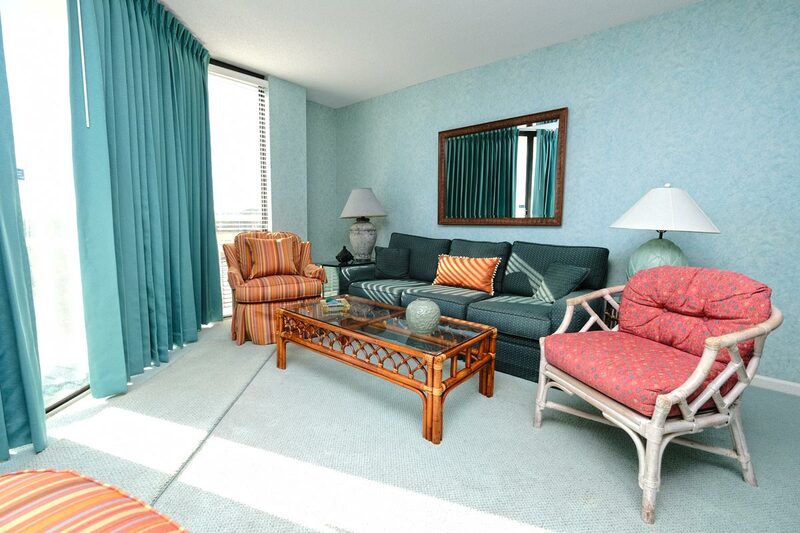 For oceanfront views from the comfort of your own private balcony, come visit Ocean Creek's North Tower! 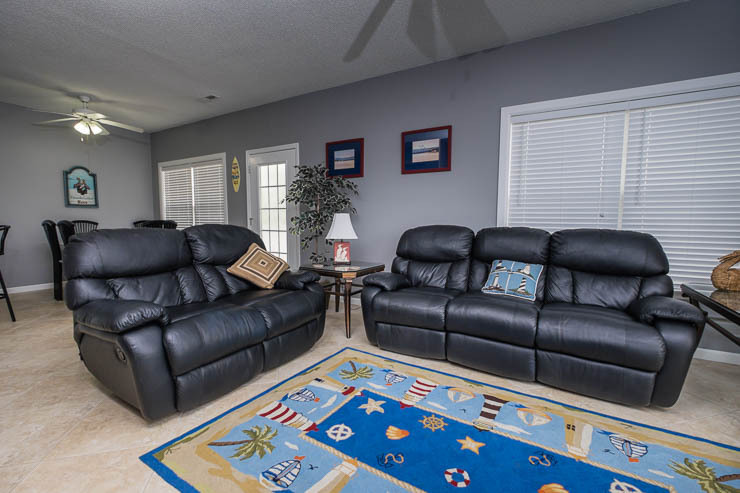 This North Myrtle Beach vacation rental is great for small groups, comfortably accommodating up to 4 guests. With 1 King bed and 2 Twins, A5 is perfect for family vacations! With tile floors throughout, this condo comes with a fully-furnished kitchen, featuring major appliances and other cooking essentials. 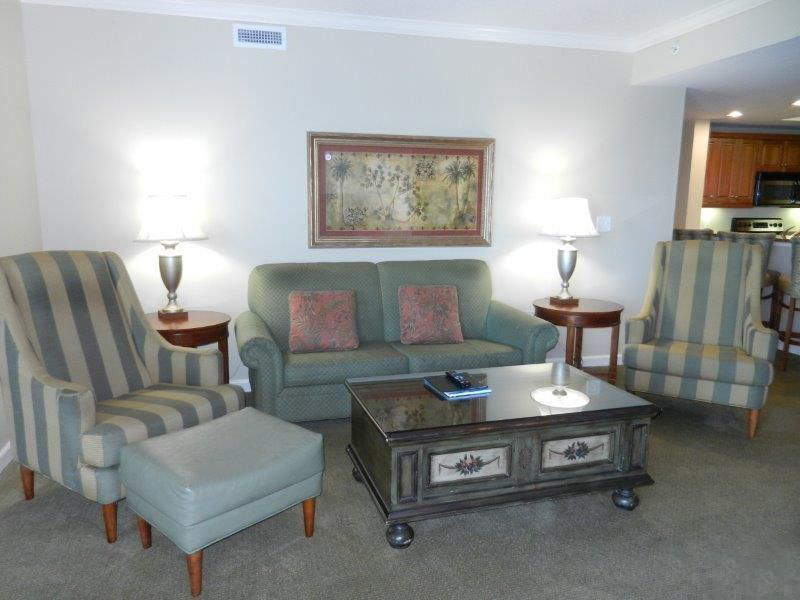 Enjoy complimentary WiFi Internet access, as well as multiple TVs with cable situated throughout the unit. Take care of your laundry needs with the in-unit washer and dryer. On-site amenities include elevator, indoor pool, outdoor pool, Jacuzzi, tennis courts, and restaurant! 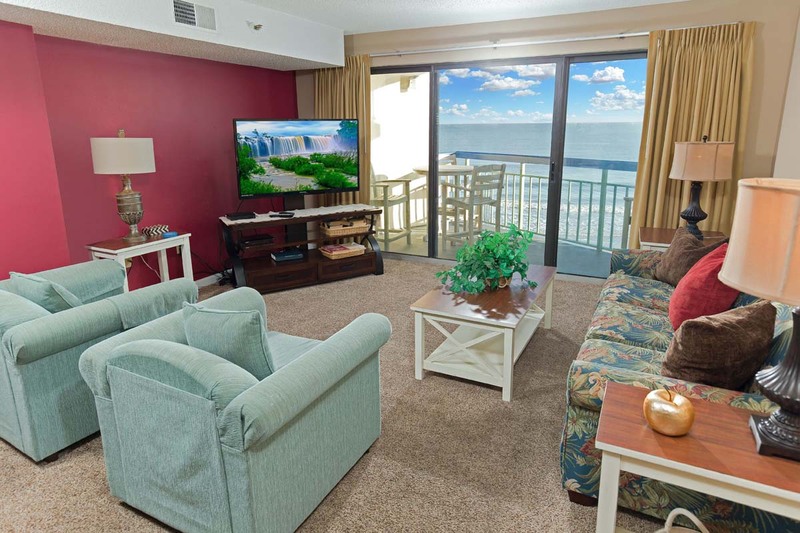 For a North Myrtle Beach vacation you aren't likely to forget anytime soon, visit Ocean Creek's North Tower unit A5! 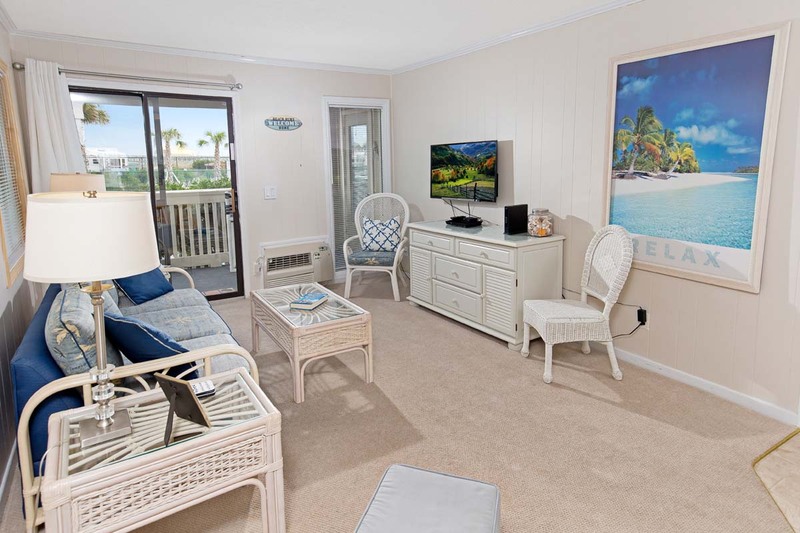 Welcome to Ocean Creek South Tower PP3, where the comforts of home combine with the excitement of vacation to give you the perfect beach experience! This 3 bedroom, 3 bathroom ocean view condo is located on the 3rd floor, and offers up impeccable ocean views and easy beach access. The unit can accommodate up to 8 guests, and includes 1 Swing King bed, 2 Double beds, 2 Twins, and a Queen-sized sleeper sofa. Additionally, you will find a fully-furnished kitchen, featuring major appliances and other cooking essentials, as well as an in-unit washer and dryer for all of your laundry needs. Stay connected with complimentary WiFi Internet access, and use the multiple TVs throughout the condo to stay up-to-date on the latest headlines and shows. Take advantage of the on-site amenities, which include indoor pool, outdoor pool, Jacuzzi, and tennis courts! Ocean 7 #1 is a welcoming 4 bedroom, 3 bathroom rental just off the beach, with partial ocean views and from the covered balcony. With plenty of room to comfortably accommodate 12 people, you can get together with family and friends with ease. Head up the stairs to this bi-level spacious townhome that offers all of the comforts of home, including free wireless internet, a land line with free local calls, and an in-unit washer and dryer. The living area has comfortable, contemporary style with a queen-sized sleeper sofa, arm chair, ottomans and large flat screen TV. The large dining table has seating for 6 to 8, with additional seating at the counter for 4. The kitchen is fully-equipped with all that's needed to prepare gourmet meals, and features custom cabinets with stainless steel appliances. Enjoy the warm ocean breeze while sitting on the private balcony overlooking South Ocean Boulevard, just off the living area. All of the bedrooms throughout the home have beautiful wood floors and elegant, dark headboards with matching nightstands. There are 2 bedrooms on the main level, the first of which offers 2 full beds, balcony access, and a TV, while the second bedroom has one full bed and a TV. You'll find the third and fourth bedrooms upstairs, with a full bed and king bed, respectively. The 3 full bathrooms all have smooth tile flooring with shower/tub combinations. 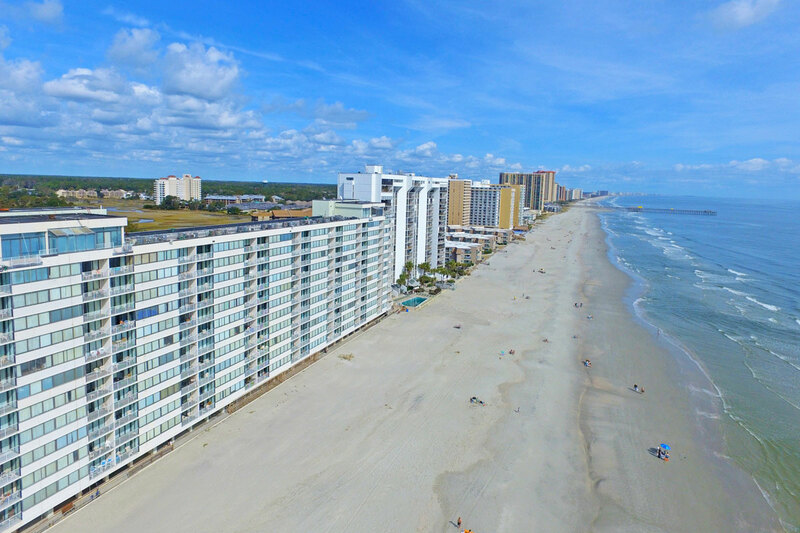 Prepare to be amazed by the 15th floor view of the majestic Atlantic Ocean and the Myrtle Beach horizon whenever you reserve a stay in Patricia Grand 1504, our 1 bedroom, 1 bathroom ocean view vacation rental from Beach Vacations. 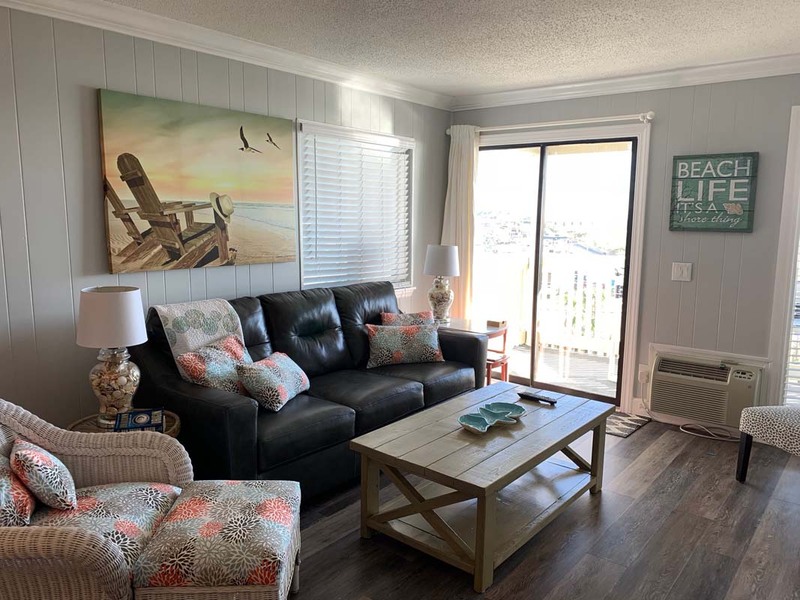 This cozy condo is located along Ocean Boulevard in Central Myrtle Beach, making it a convenient location to many of the area's most exciting attractions. Right next door, you'll find impressive dining options like New York Prime and Sea Captain's House! 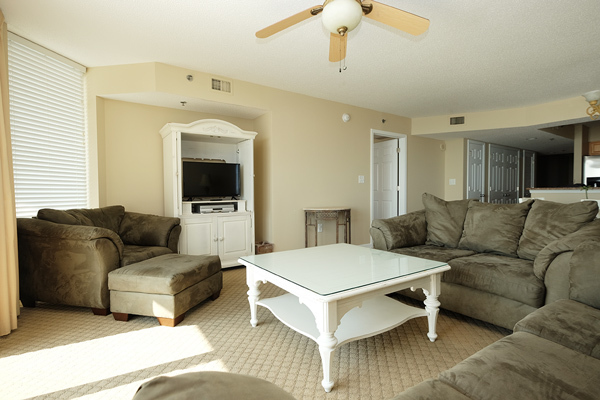 Furthermore, when you reserve a stay in this fantastic condo rental, you will only be a mile away from all of the fun things to do along the Myrtle Beach Boardwalk. Inside the condo, enjoy the convenience of a fully-equipped kitchen, including everything you'll need to make a wonderful meal, from major appliances like stove and refrigerator to cooking essentials like pots, pans, and utensils. You'll feel like a professional chef as you make your way around this lovely kitchen, which features granite countertops for that extra touch of elegance. 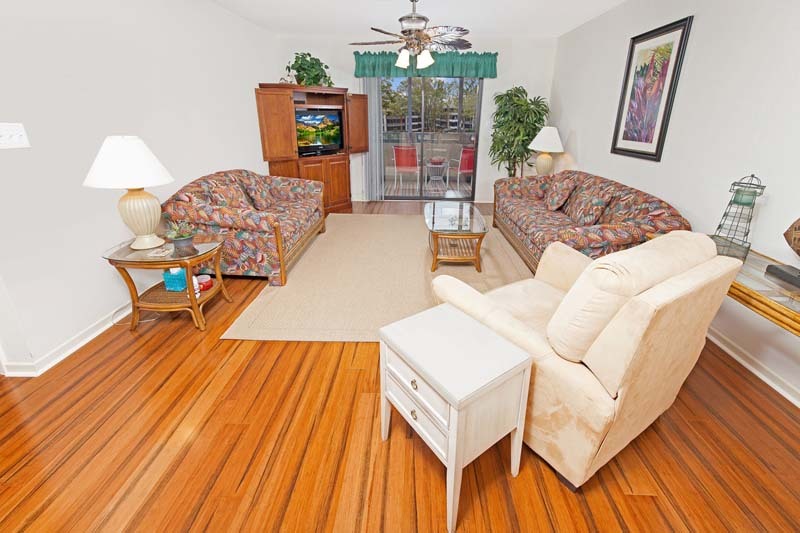 This condo also features new carpet and tile flooring, making your stay even more comfortable. 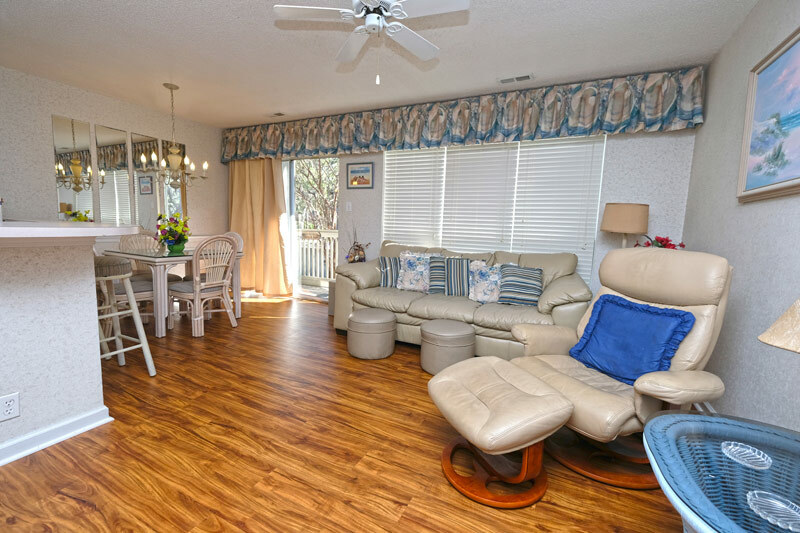 There are plenty of places to relax and lounge around in this Myrtle Beach vacation rental. Accommodating up to 4 guests, Patricia Grand 1504 includes 1 King bed, as well as a Queen-sized Murphy bed and many other furniture pieces located around the condo. Enjoy multiple flatscreen televisions with cable, as well as complimentary WiFi Internet access throughout the duration of your stay, and make sure to take advantage of your own private balcony, which offers breathtaking views from high above the coast. The onsite amenities are far-reaching and promise to make for an epic beach vacation. On the property, you'll find indoor and outdoor pools, lazy river, Jacuzzi, restaurant (located on the 2nd floor), fitness center (2nd floor), gift shop, and laundry facilities (Floors 4, 8, 12, and 17). 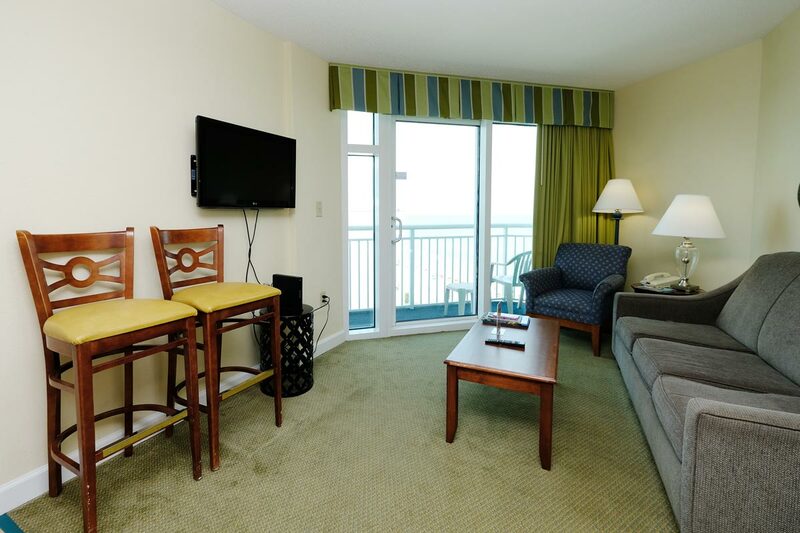 When you select Patricia Grand 1504 for your next Myrtle Beach vacation, you'll be in for a fabulous adventure, with memories that will last a lifetime! Stay just across the street from the beach when you reserve this 4 bedroom, 4.5 bathroom condo at Pelican Manor! This Second Row vacation rental is perfect for large groups, as it offers spacious living areas and comfortably accommodates up to 12 guests. With 1 King bed, 2 Queens, 2 bunk beds, and 2 Twin beds, there's plenty of room for everyone! Enjoy the convenience of having your own fully-furnished kitchen, which includes major appliances and other cooking essentials like flatware and cookware. Stay on top of the news and your favorite shows with multiple flat-screen TVs with cable throughout the unit, and stay connected with complimentary WiFi Internet access. Take care of your laundry needs with the in-unit washer and dryer. Spend the day relaxing on the wraparound deck area, as you enjoy the sights and sounds of the beach! Ready for your next beach vacation in Myrtle Beach? 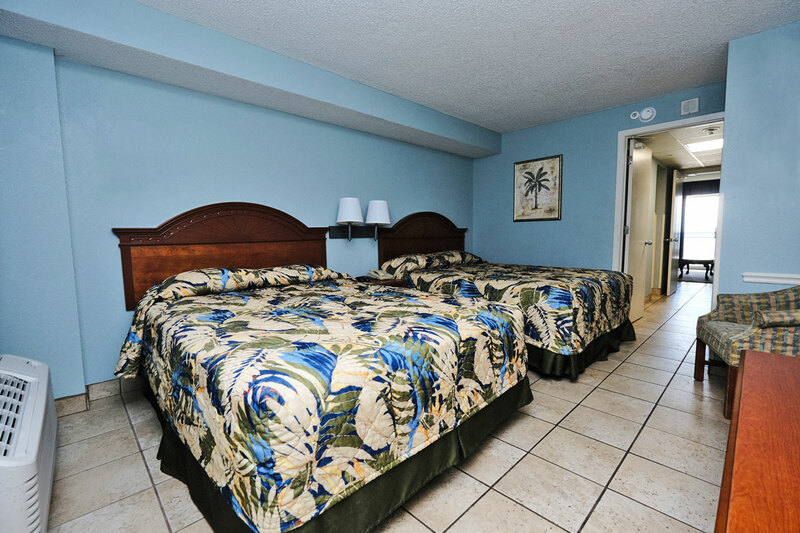 Pelicans Landing makes for the perfect escape for up to 6 guests. This 3 bedroom, 2 bathroom vacation rental is located on the 2nd row, meaning it's just a short walk to the beach! You'll find 2 Queen beds and 2 twins in this charming first-floor condo. This unit also comes with a fully-furnished kitchen, featuring major appliances, as well as cooking essentials. 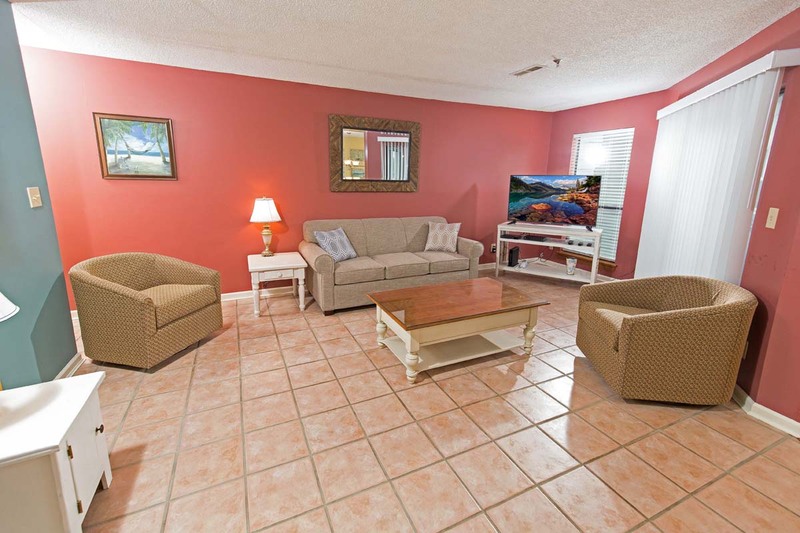 Don't miss your favorite shows and local news, as the condo includes multiple TVs throughout. Take care of your laundry needs with the in-unit washer and dryer. Spend some time relaxing on your own private balcony, as you take in the sights and sounds of the beach. On-site amenities include sparkling outdoor pool! Welcome to Sands Beach Club 1022, where you'll have unforgettable views of the Atlantic Ocean from your own private balcony located on the 10th floor. Watch the coast stretch for miles from the comfort of your own vacation rental! This 2 bedroom, 2 bathroom condo sleeps up to 6 guests, so it's great for families and smaller groups looking for an exciting beach vacation. Featuring 1 Queen bed, 2 Twin beds, and a Queen-sized sleeper sofa, this unit provides you with all of the comfort you need for a relaxing stay. Save time and money thanks to the convenient fully-furnished kitchen, which includes major appliances and other cooking essentials. Have breakfast, lunch, and dinner while overlooking the beach! 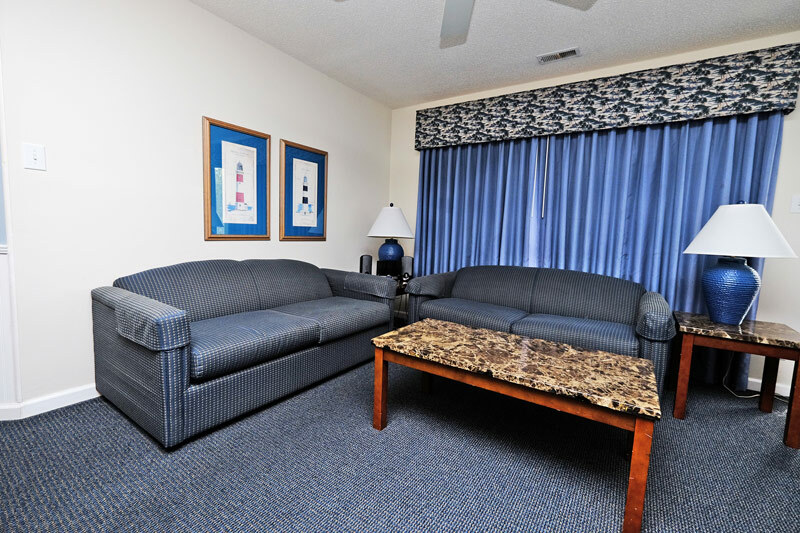 Don't miss your favorite shows, as there are multiple cable TVs located throughout the unit, and stay connected thanks to complimentary WiFi Internet access. Step outside your vacation rental to enjoy the many amenities offered at Sands Beach Club, including indoor pool, outdoor pool, Jacuzzi, exercise facility, basketball courts, and tennis courts! You're just a stone's throw from the Atlantic Ocean when you stay in Unit 123 at Sands Beach Club. This 2 bedroom, 2 bathroom oceanfront condo is located on the first floor and can sleep up to 6 guests. Bedding includes 1 Queen bed in the master bedroom, 2 Twins in the second bedroom, and a Queen-sized sleeper sofa in the living area. The unit comes with a fully-furnished kitchen, featuring major appliances and other cooking essentials, like cookware and flatware. Enjoy cable shows via the multiple TVs located throughout the condo, and connect to complimentary WiFi Internet during your stay. Take in the beauty of the beach from the comfort of your own private balcony, or make the easy trek to the ocean for a fun-filled beach day! Enjoy on-site amenities such as indoor pool, outdoor pool, Jacuzzi, exercise facility, and basketball courts. Book Sands Beach Club 123 for your next beach vacation! 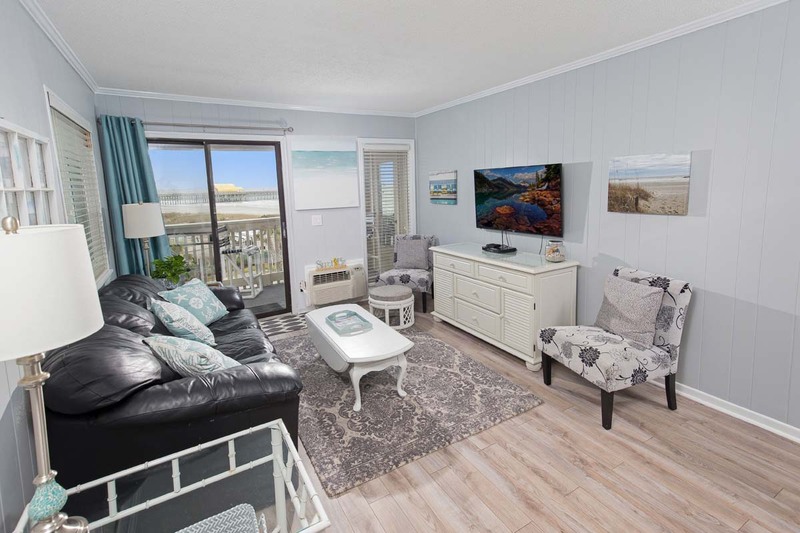 Welcome to SeaWatch Resort, where your Myrtle Beach condo rental brings you all of the excitement of vacation, as well as the conveniences of home. Unit 611 is a 1 bedroom, 1 bathroom oceanfront condo, which can comfortably accommodate up to 4 guests. With 1 King bed and a Queen-sized sleeper sofa, this vacation rental is perfect for couples or small groups. Located on the 7th floor, enjoy beautiful ocean views from the comfort of your own private balcony overlooking the coast. Take advantage of the unit's fully-furnished kitchen, which includes major appliances and other cooking essentials. The condo features multiple cable TVs and a DVD player. On-site amenities include indoor pool, outdoor pool, Jacuzzi, lazy river, and on-property restaurant. You may never want to leave the SeaWatch Resort! 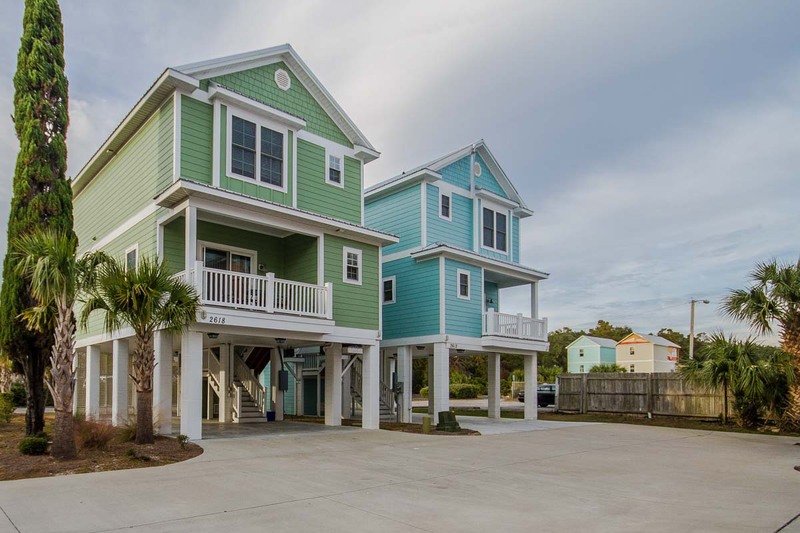 Welcome to South Beach Cottages 2618! This 4 bedroom, 3.5 bath home is located directly across the street from the beach on the quiet south end of Myrtle Beach on 27th Ave. South and Ocean Boulevard. This is an upscale beach home constructed in 2013 with room to accommodate 10 people with ease. Step inside this classic raised home to be greeted with cool tile floors, tasteful decor, and modern furnishings. In the living area, you'll find comfortable seating for four on cool leather furniture, where you can relax and watch your favorite shows after a long day in the sun. The gorgeous kitchen has all that's needed to prepare meals for family and friends, and you can cook in style with granite counters, rich wooden cabinets, and black appliances. Dine or play games around the dining room table with seating for 4, and take advantage of additional seating for 4 at the counter. Just off the living room is a covered porch with patio seating, the perfect place to catch a refreshing sea breeze while sipping on a cold beverage. One bedroom is located on the first level with an adjoining full bathroom, a comfortable queen-sized bed and TV. There is also a half bathroom on the first level. The other three bedrooms and bathrooms are located on the second level. One room offers a queen-sized bed with a private, attached full bath. The third bedroom offers 2 twin beds, and the fourth bedroom offers a double-sized bed (250lbs max) with a twin-sized overhead bunk. A full bathroom is located off the second floor hallway. A full sized washer and dryer are also located on the second level. Parking is a breeze with room to park 3 vehicles off the street and covered. While staying at South Beach Cottages guests enjoy access to the community outdoor swimming pool to cool off in during warm summer days. Welcome to South Beach Cottages 2709! 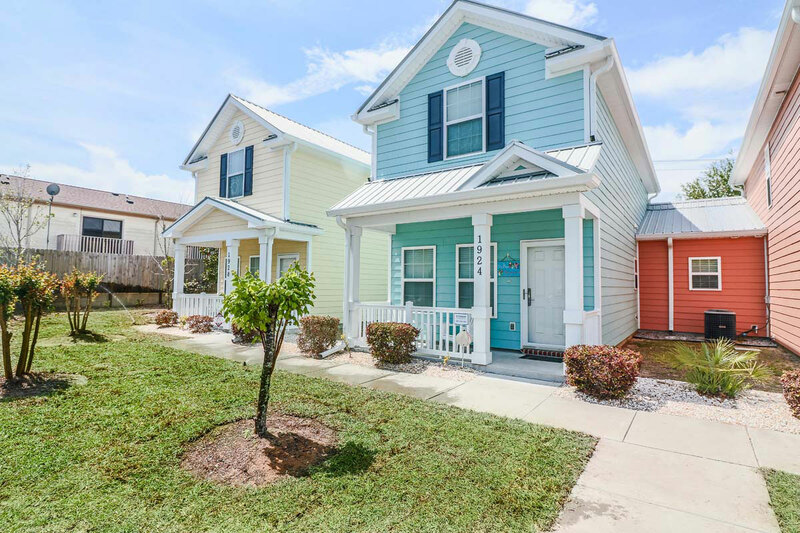 This 3 bedroom, 2.5 bath home is located directly across the street from the beach on the quiet south end of Myrtle Beach on 27th Ave. South and Ocean Boulevard. This is an upscale beach home constructed in 2013 with room to accommodate 8 people with ease. 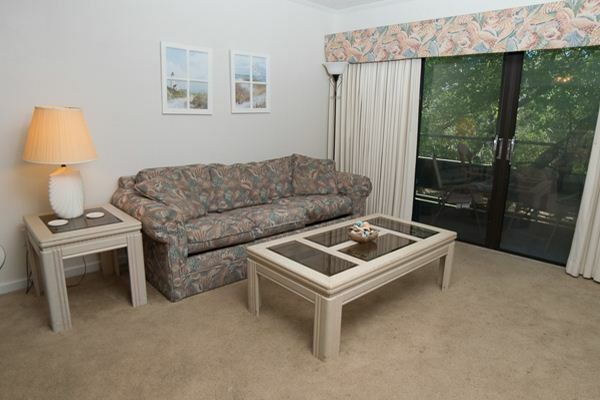 Settle into Summertree Village J8 during your next Myrtle Beach condo rental experience! This 2-bedroom, 2-bathroom unit puts you right along the Atlantic coast and within walking distance to the ocean. 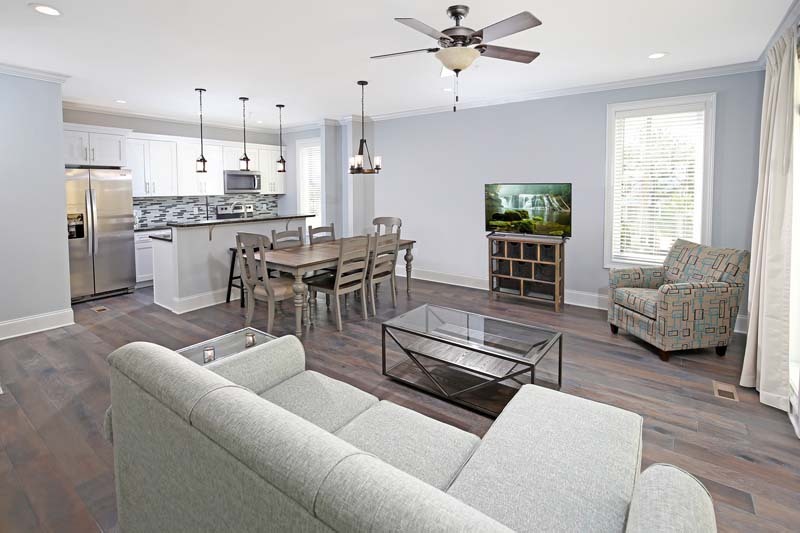 Guests can take advantage of cozy interiors, featuring laminate flooring throughout, fully-equipped kitchen, screened porch and balcony, and comfortable accommodations. Bedding includes one Queen in the main bedroom and 2 twin beds in the second bedroom. Enjoy the fabulous on-site amenities, including indoor and outdoor pools, Jacuzzi, and sauna. Best of all, you'll be just a short walk to the beach! 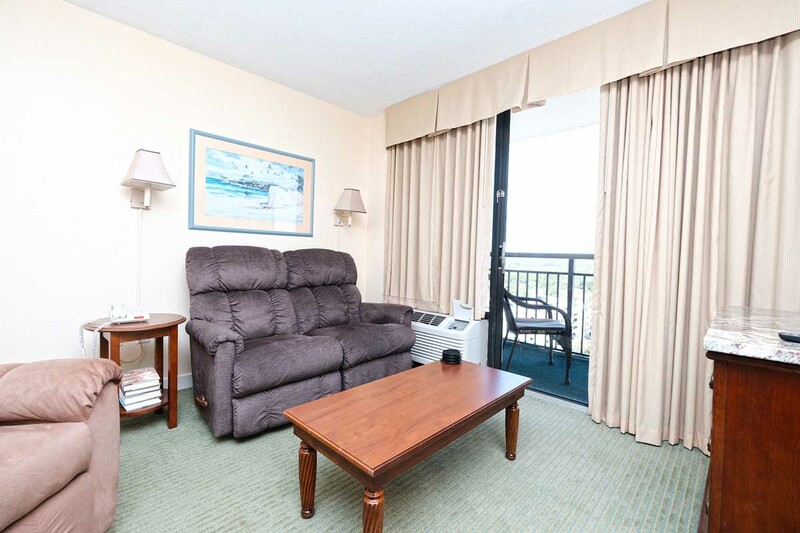 Reserve your next Myrtle Beach vacation in Summertree Village J8. Come stay at The Oceans, where the beach is front and center! 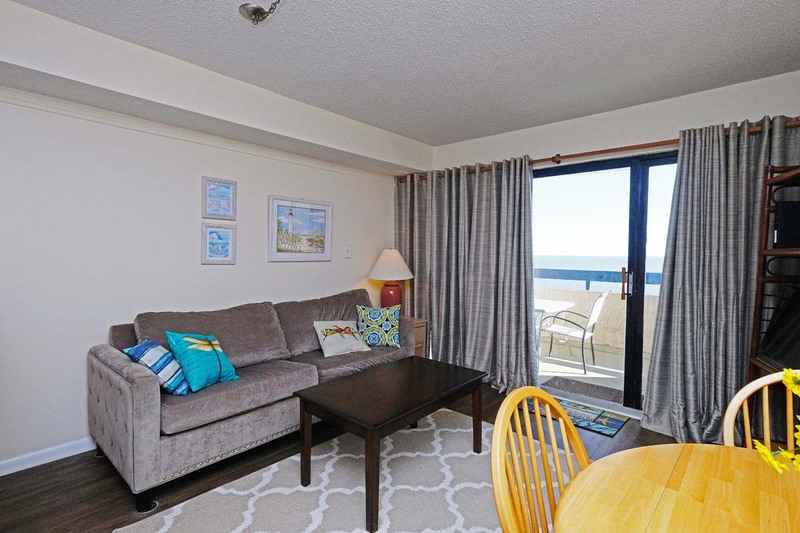 Ocean 504 is a 2 bedroom, 2 bathroom oceanfront vacation rental, which can comfortably accommodate up to 6 guests. Featuring 2 Queen beds, 2 Twins, and a Queen-sized sleeper sofa, this condo is perfect for families and smaller groups. Located on the 5th floor, you'll have breathtaking views of the Atlantic Ocean from the privacy of your own balcony. Enjoy the convenience of a fully-furnished kitchen, which includes major appliances and other cooking essentials. Stay on top of local news and all of your favorite shows via the multiple TVs found throughout the condo, and take advantage of complimentary WiFi Internet access. Be sure to visit the on-site outdoor pool to keep cool during those hot summer weeks! 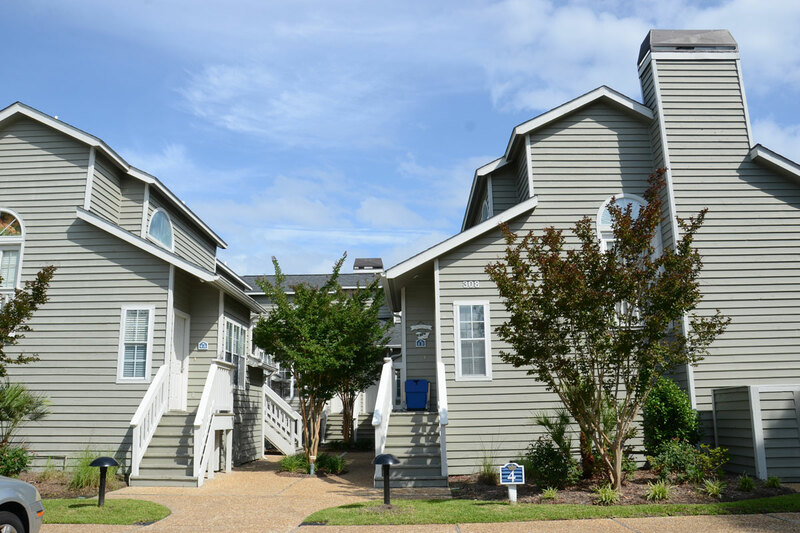 Windy Hill Dunes brings you a large Myrtle Beach vacation rental that will accommodate the entire family! With 2 King beds, 2 Queens, 2 Doubles, and a Queen-sized sleeper sofa, this condo can sleep up to 12. 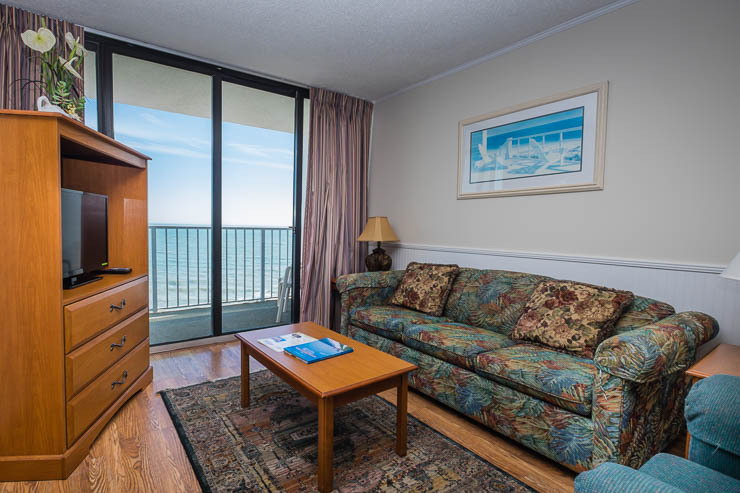 Enjoy oceanfront views from your 13th floor private balcony, and take advantage of all of the in-unit amenities including fully-furnished kitchen, dishwasher, microwave, washer/dryer, and multiple TVs with cable. On-site amenities include outdoor pool and Jacuzzi, lazy river, and exercise facility. 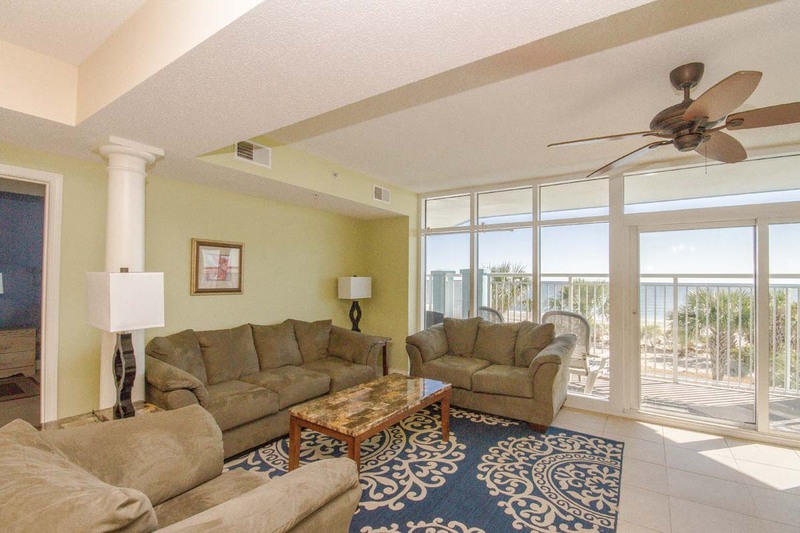 Reserve this beautiful unit for your next big beach vacation!